I love a good spicy kick to my food so you can imagine how thrilled I was when I made this by accident (I’ll explain) and it tasted just like what they have back home. So how does one cook something by accident? I was hungry and I wanted something rather healthy and with prawns in it. 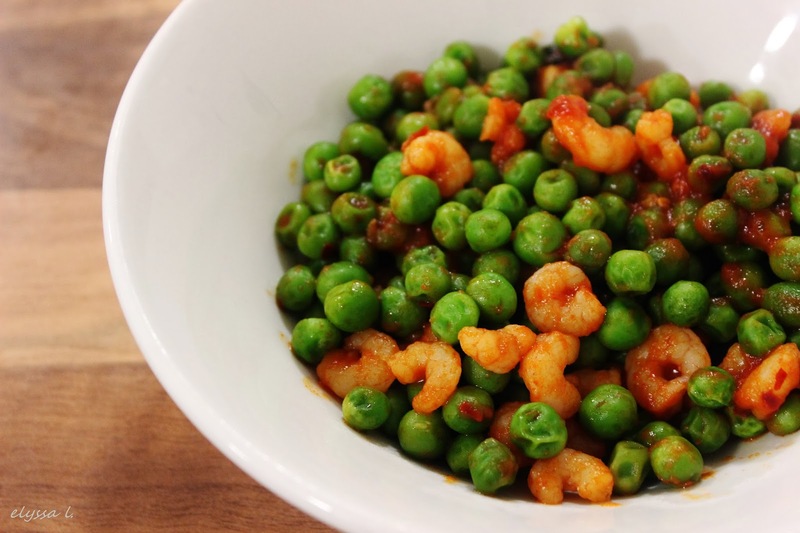 I love peas to bits so I put them both together and stir-fried it briefly with tomato paste. It tasted great. I ate it all and saw the 1/4-full bag of tiny frozen prawns being all sad on the counter, so I decided to cook them and maybe save them for lunch the next day. I wanted something spicy so I added dried chilli flakes to the oil and tomato paste before putting the prawns in, then topped it off with a bit of coriander for fun – I really do these random things for fun; what is my life – and then had a taste. It was like biting into a little piece of Singapore. 1. Heat a bit of oil in a saucepan. Once it’s hot, add in the dried chilli flakes and ginger and let it fry for half a minute so all the spicy goodness comes out. 2. Add the tomato paste and fry that for a while. 3. Add the prawns. Feel free to pour a bit of water in if it gets too dry. Season to taste with salt. 4. Tear or roughly chop some coriander leaves and toss with the prawns. For the non-spicy version, just do exactly the same thing without the chilli flakes or coriander. It tastes quite nice and homely (to me, anyway) but it isn’t as good as the spicy one. Maybe I’m just biased. I like my chillies.